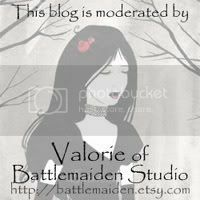 Battlemaiden Studio: New things to look forward to! custom shop name decals. Advertise while you drive! I have ordered a button press, and it should be coming in the mail today! I'll have buttons and pocket mirrors featuring my artwork really soon! We'll be cutting and assembling buttons all weekend to get ready for A-Kon, and as soon as I've got time to photograph them, I'll list a handful on Etsy. I've got a friend coming up to visit this weekend and help with the munchkin so I can get as much painting done as possible. I just recently bought a button machine myself. It's a lot of fun and very easy to use. Let me know how it goes.